1. 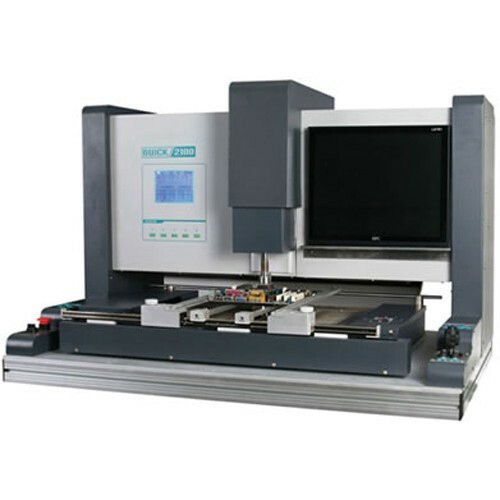 High automatization, the de-soldering, pick-up and placement of chips can be finished by one button, easy operation. 2. Use large power brushless DC fan, closed loop of sensor and micro-computer zero triggering, can generate large volume of hot air. No need for external air supply, easy operation. 3. Seven temperature areas, suitable for reflex BGA, multilayer BGA and metal shielding case. 4. Integrative design, combines heating system and alignment system together. 5. Visible double-colors optical lens alignment, controlled by rocker, clear and precise. 6. Large power fan, speed adjustable, cool bottom heating area quickly. 7. QUICKSOFT interface, with operation right limitation and profile analysis function available. Can analyze preheating speed, peak temperature, temperature preserving time and cooling rate effectively. 8. Various types of titanium alloy hot air nozzles available, easy replacement. 800W hot air power for top and bottom heaters, airflow is stepless. The temperature of main heating area can rise quickly. Heat distributes evenly, decrease the vertical temperature difference between chip surface and soldering joint, shorten the whole process. Seven temperature areas, air volume, temperature and heating time of both top and bottom heaters can be adjusted as per requirements. Accurate temperature and even heat distribution can ensure the precision and flexibility of the process. External 5 K-type sensors, can monitor temperature of PCB and BGA accurately. Vacuum will generate automatically and pick up BGA chips when the process is finished, then the vacuum will return to original position.